Since 1991, Graphite Machining Services & Innovations, LLC. (GMSI) has been a key supplier to top-tier chip and memory manufacturers as well as front-end semiconductor manufacturers. GMSI also provides products and support for the LED industry. 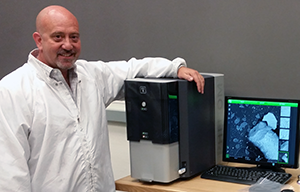 Peter Guercio and colleagues at GMSI, none of them microscopists, use their Phenom ProX scanning electron microscope (SEM) daily for advanced materials research and development. The Phenom ProX includes energy dispersive X-ray spectroscopy (EDS), a technique that also benefits quality control of processes and products. Real-time acquisition combined with elemental analysis capabilities provides data 8x faster than before and proved critical for recent product improvements. GMSI uses chemical vapor deposition (CVD) processes to produce SiC films on graphite for the semiconductor and LED industries. For a time, GMSI was outsourcing all SEM work. This took time and resources to send samples out for testing and then wait for results. A few years ago, SEM work was brought in-house with a Phenom G1 SEM. Process improvements were done faster with no wait time for data. Now the Phenom SEM is used daily for research and development plus quality assurance of processes and products. “No other tool can do what the Phenom SEM does!” proclaims Peter at GMSI. Having a Phenom SEM on site has been a huge time saver. The SEM is used to measure film thicknesses and surface morphology as a function of processing parameters. The Phenom data immediately provides critical feedback of SiC diffusion into the graphite and the crystal structure of the surfaces. Because the Phenom SEM uses a backscattered electron detector (BSD), elemental contrast quickly shows the SiC film on the graphite substrate. The SiC film is bright compared to the substrate so the depth and distribution of the SiC diffusion into the basal planes of the graphite can be measured. The diffusion of SiC into the substrate is critical to prevent film delamination. BSD image with the Phenom SEM shows the SiC film as brighter compared to the graphite substrate, allowing quick thickness measurements. The correlative microscopy ability using the integrated camera is another benefit of the Phenom SEM for GMSI. The optical navigation is synchronized with the electron microscope image to show where defects are located, allowing quick investigation of specific areas of interest. 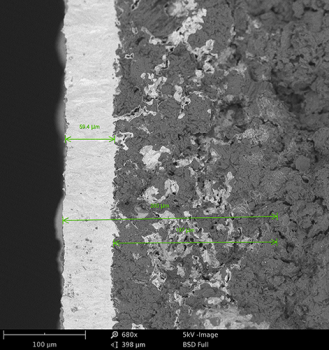 Crystal morphology is also evaluated with the Phenom SEM, showing film coverage even within defect sites. The Phenom SEM has easy navigation with the motorized XY stage to move to a site of interest, like this defect shown below. SEM images showing crystal morphology with magnifications at 1000x and 3900x, left and right, respectively. GMSI traded in the G1 SEM for a Phenom ProX with EDS. The higher magnification provides a full picture of every step of the process. The elemental analysis from EDS shows the elemental composition of the films, allowing GMSI to set the deposition parameters to achieve the optimum stoichiometry.